Surface-mounted stainless steel corner guards are a cost-effective alternative to expensive wall repairs. Our stainless steel corner guards are easy to install and come in a wide variety of styles and materials to meet virtually any requirement. Our stainless steel corner guards offer a Class A fire rating, and the stainless steel construction offers superior chemical resistance. Angle: 90º standard. 135º also available. Standard wing sizes: 1-1/2", 2", 2-1/2", 3"and 3-1/2". Standard lengths: of 40", 48", 60", 72", 84", 96", 108" and 120"
Custom wing sizes and lengths: Minimum of 3/4" wings. Priced based on measurements rounded up to next standard sizes. Lengths over 8' must ship via freight, so consider butting two smaller pieces together on small orders to save a considerable amount on shipping costs. Radius: 1/8" standard. 3/4" bull-nose radius also available. Gauge: 18, 16 or 14 gauge stainless steel. Easy to install: mastic adhesive standard; predrilled for pan head available for all gauges, countersunk available for 16 and 14 gauge. Screws or mastic are supplied at no additional cost. Please note: a true countersunk can only be achieved with 14 gauge and thicker material, 16 gauge is punched to form a sunken hole. The sunken hole causes the guard to sit slightly away from the wall and will also grip sheet rock. NEW: Now also available with double sided tape for peel and place installation. Finish: Satin finish standard. Bright finish available on 18 gauge maximum of 5' in length. Type: 430 stainless steel standard. Available in type 304 for exterior or food grade applications, non-magnetic. NEW: Now also available in Bright Brass, 20 gauge, lacquered finish. Wing sizes: 3" - 5" standard. Custom sizes available. Web sizes: 3.5" - 6.5" standard. Custom sizes available. Length sizes: 48", 60" and 96" standard. Custom sizes available. Sizes: Standard widths: 22", 28",30", 34",35", 40" and 46". Standard heights: 8", 10" and 12". All orders under $100 material cost will be charged a $30 handling fee. 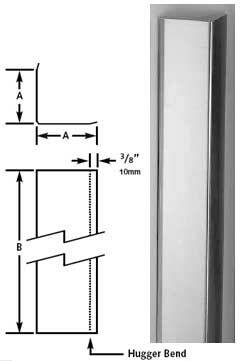 Wings 40" 48" 60" 72" 84" 96" 108" 120"
Add on to cost of stainless steel corner guards as priced out above and add the suffix T to the model number. For example, CP3548, 3.5" x 3.5" x 48" 18 gauge with mastic is $62.00. Adding tape will change to model number to CP3548T and the price becomes $69.00 ($62.00 + $7.00). Wings & Webs 48" 60" 96"